Sample: 30" (76 cm) deep and 60" (152.5 cm) across top; can also be customized. 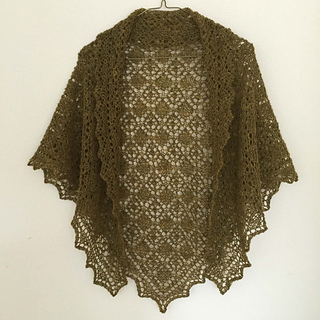 The lace on this shawl reminds me of spring flowering trees in the Pacific Northwest, and the shawl’s construction was inspired by the beautiful garter stitch lace triangles Robert Powell designed in the 1990’s. The shawl starts with the bottom point of the edging, and side edgings are knit as the body is worked. At the top, the corners are mitered with short rows, and the top stitches are bound off with an edging that folds back to form a scalloped collar. The garter stitch lace repeats over 48 rows, and it can be worked from written instructions or charts. This design also can be customized for other sizes and weights of yarn. The sample was knit with Shetland 2-ply yarn. US size 7 (4.5 mm) and size 6 (4 mm) 32” (80 cm) circular needles; and US size 6 (4mm) double- pointed needles.